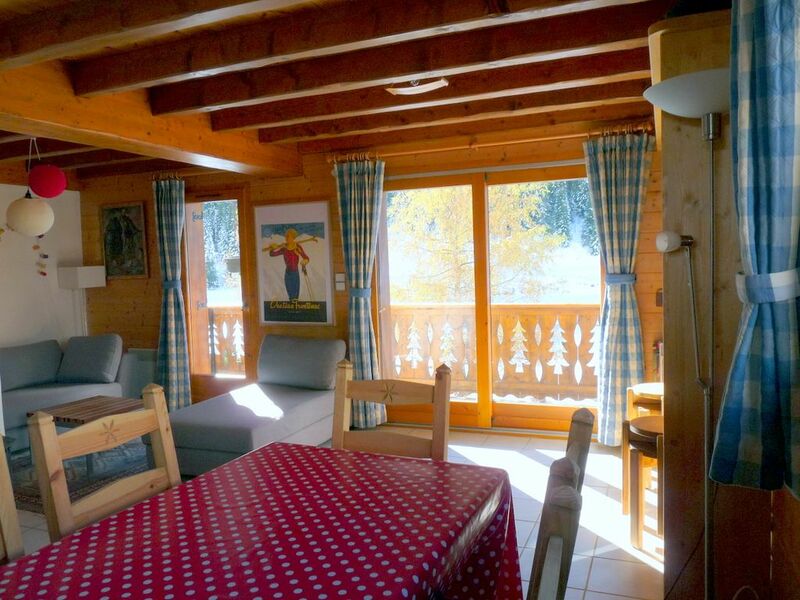 APARTMENT LOCATED ON 1 AND FLOOR IN A SMALL CHALET OF 4 WOOD APARTMENTS IN CHAMPAGNY LE HAUT. We are two newly retired people who for more than 30 years have loved this beautiful valley of Champagny le Haut. We just acquire (12/2012) this nice apartment that we'd love you to enjoy. For more than 30 years have loved this beautiful valley of Champagny le Haut. We just acquire (12/2012) this nice apartment that we'd love you to enjoy. We have always dreamed of having a pied-a-terre in Champagny le Haut, in the slightly remote area well surrounded by high mountains. This apartment is our second home and we are planning many trips with our children and grand children. This is not a financial placement but rather a dream come true. The location is magical. We wanted it to be a comfortable apartment with all amenities. The view is wonderful from everywhere. The wood-burning stove warms the whole apartment but we also have electric heaters if you prefer. The garage, where the wood is, allow for one car to be parked as well as all sport equipment. The apartment is spacious, comfortable, warm and clean. The location is quiet and peaceful with wonderful views. Although a few miles above Champagny there is a free ski bus service available (we did not use it as we prefer the convenience of using our own car). There is a very well equipped kitchen and plenty to keep you entertained in the evening. The owners and their local representative were very helpful. Nous avons passé de très belles vacances dans ce bel appartement. Tout l'équipement y est, rien ne manque! Très bien situé, au calme, les vues du balcon et des chambres sont magnifiques. Une belle adresse à retenir pour revenir faire les sommets que nous n'avons pas eu le temps de découvrir. Quinze jours de vacances formidables dans un appartement très très agréable , bien ensoleille , bien agencé , avec tous les équipements nécessaires et très propre.le reve , un petit paradis !!!! Bravo aux proprietaires pour tout le confort. Nous avons découvert le ski de fond en famille et le joli plateau de Champagny le Haut: les enfants veulent revenir!